These Beatles’s lyrics come as close to describing the sensation of entering "Talisman" as this writer can suggest. "Talisman" is the latest museum installation by Puerto Rican artist Ángel Suarez-Rosado currently at the Allentown Art Museum through December 16. This versatile artist has created a brilliant, eye-popping, colorful simulation of the uniqueness of Puerto Rico with manufactured objects as mundane as kitchen utensils, car parts, and pineapple fashion flip-flops, to baskets of nature’s sublime gifts of seashells, dried peas and beans, honeycombs and pebbles rounded by the constantly rolling waves surrounding the island. “Trees” standing about 5 feet tall with trunks made from crutches and wood branches decorated with unexpected objects create a forest-like landscape inviting visitors to wander in and out and around them, taking in the kitsch along with the symbols of nature and religion. Suarez-Rosado is a native of Cayey, one of the towns in a mountainous region of Puerto Rico. If you have not visited the island, you may not be aware of the beauty and amazing diversity of Puerto Rico – from its sandy beaches and verdant mountains to the quaint villages, colonial cities, and sophisticated capital, San Juan, as well as El Yunque, the only tropical rainforest in North America. Suarez-Rosado trained at the School of Visual Arts in New York City and received his Master’s degree from the State University of New York, Buffalo. The grandson of a curandero (healer) and herbolaria (herbalist), Suarez-Rosado’s Espiritismo (Spiritism) and ritual are in his genes. Wall text reminds the visitor of the mingled ethnicity of Puerto Ricans whose Caribe and Taino natives were conquered by Spaniards who brought with them African slaves so that Yoruba religion and Roman Catholicism blended with native beliefs and practices. Santaría is another blended religious custom. 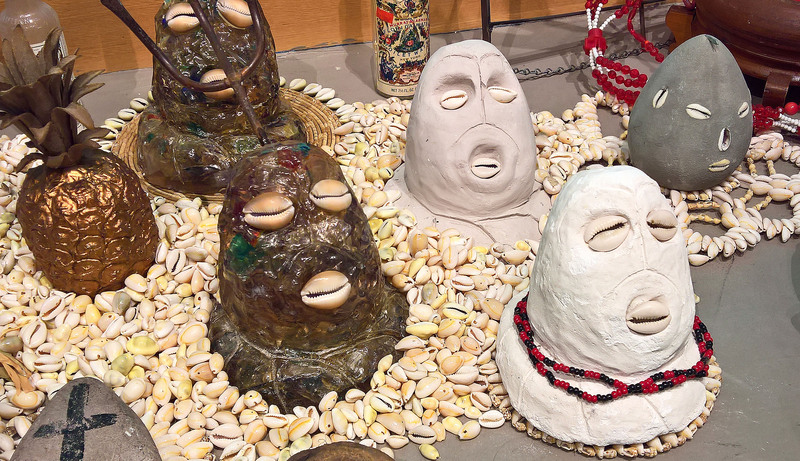 Suarez-Rosado dedicated his installation to one of Santaría’s primary figures or orishas, Babalú-Ayé, who is often syncretized with Saint Lazarus, patron saint of the poor and sick. Lazarus’s symbol, crutches, are prominent in Suarez-Rosado’s installation. Yoruba sculptures typically have cowrie shells as part of their exterior, and it is the symbolism of cowrie shells alongside feathers, tarot cards, crutches, and retablos of saints and Christ that reinforce the talismanic atmosphere of the exhibition, as do the many assemblages resembling altars. On one wall of "Talisman" hangs 144 of Suarez-Rosado’s paintings of equal size but tremendous variety. They compel visitors to linger and contemplate the intricate meaning of each one. Symbolism, spiritualism, ecology, history, and humor – the wall of paintings adds to a truly delicious art experience. Finally, not prominent in the exhibition, but compelling, is a drawing of the outline of Puerto Rico and the near island of Vieques which, inside the outlines, are totally blank. The impact of this simple image is a reminder of all that Hurricane Maria took away from Puerto Rico and how little aid has been proffered to the people there. Continuing at the Allentown Art Museum are two other Latino exhibitions: "Power and Piety: Spanish Colonial Art" and "Molas," intricate fabric art from Panama. A newly installed Sol Lewitt artwork is in the hall across from the museum’s outstanding European Renaissance Art collection donated by the Kresge Foundation. The Allentown Art Museum is located at 31 N. 5th Street in downtown Allentown. It's open Wednesday through Saturday 11 a.m. to 4 p.m. Admission is free on Sundays from noon to 4 p.m. and every third Thursday from 11 a.m. to 8 p.m. There is a parking garage a block away at the corner of N. 6th Street and Linden Street.